The novelty of these fun kits is the boat-shaped soft flour tortillas. 30 seconds in the microwave is all it takes to get them ready to be stuffed and eaten. I used the Garlic & Paprika kit tonight, and chose to go vegetarian with Quorn mince instead of meat. It took less than 20 minutes to brown the quorn, season it with the Old El Paso seasoning that came in the kit, chop some lettuce and tomatoes, grate cheddar cheese and plate up. The grown-ups had the option to add fiery jalapenos to their toppings. I also laid out a choice of dips – guacamole, a fiery hot salsa in addition to the salsa that came with the kit and a cheesy dip. J was delighted with the ‘boat’ sitting on his plate. He was happy to help himself to fillings, choosing lots of lettuce and tomato to go on the mince. The boat shape meant it was easy for him to lift the taco off his plate and bite into it without the filling spilling from the other end. Something that often happens with a traditional taco. M would have preferred meat to the Quorn, but he did enjoy the flavours. 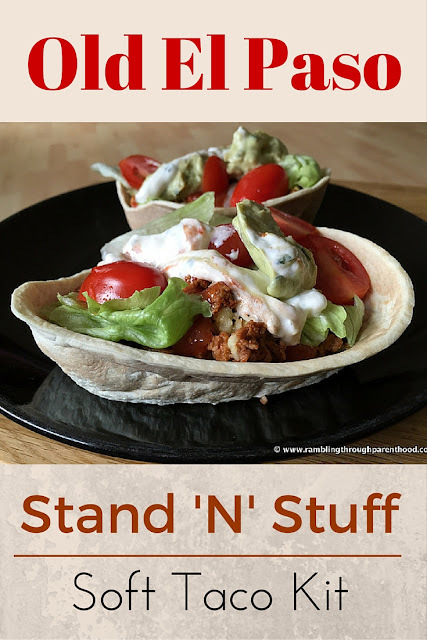 As for me, I loved the softer texture of these Stand ‘N’ Stuff tacos. And the fact that meal-time was easier and less messier than it can sometimes be. Not to mention scrumptious and really good fun. So much, that I am looking forward to trying the other kits in the Old El Paso range. As far as I am concerned, Taco Tuesday is here to stay. Disclosure: I was sent samples of Old El Paso Taco kits for the purpose of this review. All opinions are my own. Ooohh, this looks good. I'm a fan of the Old El Paso fajita kits as well as the enchiledas. I must look outt for this one! I love these sets, they are so simple to do and so tasty. I like the idea of the stand and stuff ones - a bit less mess!